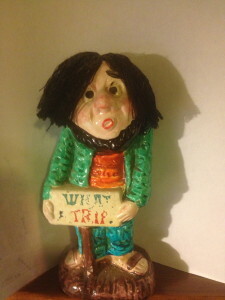 Julie’s Place was the child of Barry Smiler. 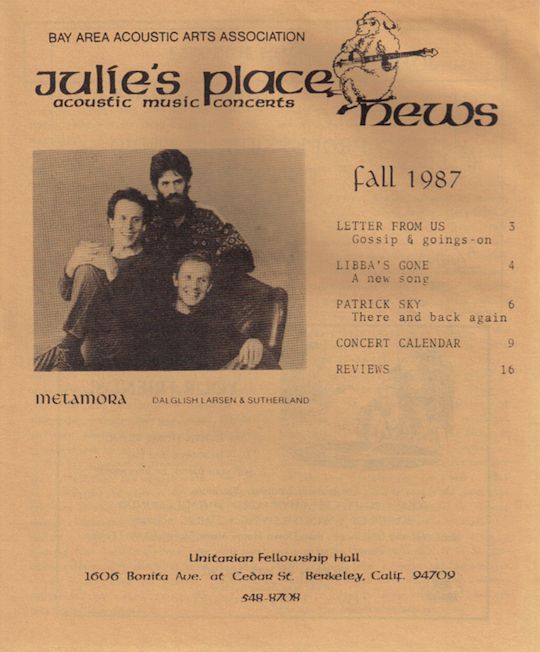 It existed in the crease between the boom of folk music that started in Berkeley in the late 1950s with the folk festival and folk clubs on San Pablo and today’s scene of Freight & Salvage, Starry Plough, Ashkenaz, and the Art House Gallery. 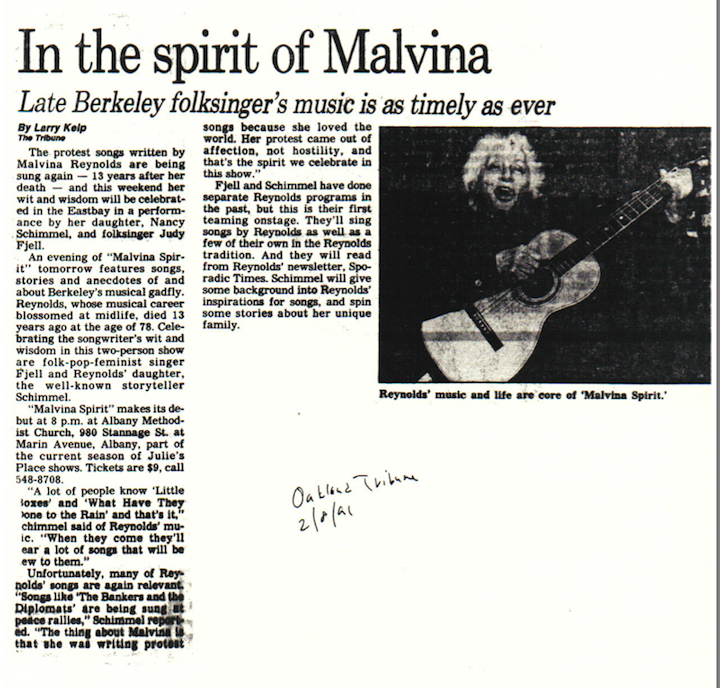 Smiler is a folk music enthusiast who came to Berkeley for the first time in 1974 while working as a merchant seaman and lived here for a while then. He returned for good in 1977. He is another son of Philadelphia! He isn’t only a folkie, but is a techie too. One of his early day jobs in Berkeley was at Mr. Calculator on Durant. It opened in March, 1974, and he worked there 1977-1978. They sold the Commodore PET (Personal Electronic Transactor), a personal computer which predated Apple, Radio Shack, IBM, Microsoft – everybody. As he built Julie’s Place, he built a tech career, first with chess software and then with financial programs. 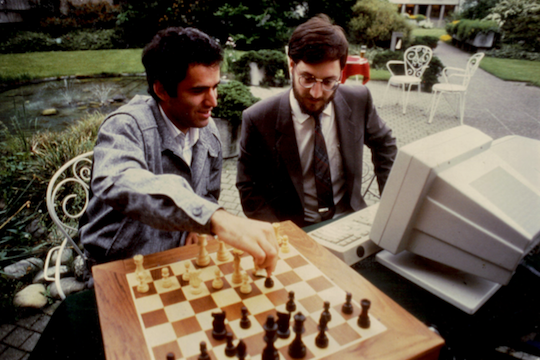 In this photograph, he is shown with chess genius Garry Kasparov, who from 1986 until his retirement in 2005 was ranked world No. 1 for 225 out of 228 months. Smiler is showing him new chess software that he had developed. I got ahead of myself. 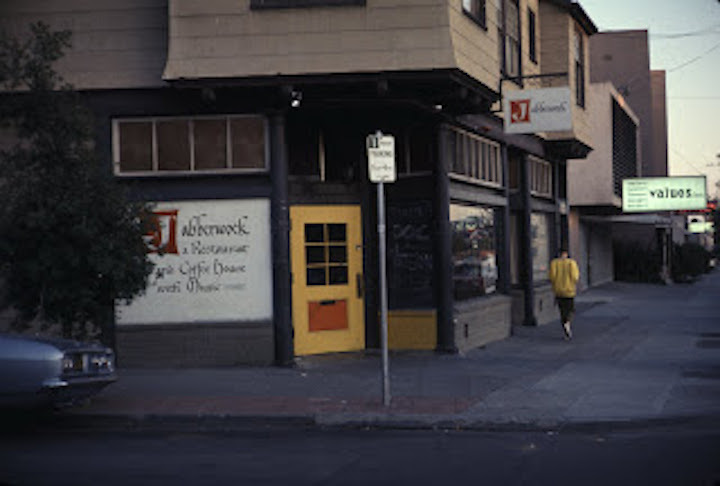 After a stint at the Village of Arts and Ideas commune at the Fish-Clark house at 1545 Dwight, he lived from 1980 until 1984 in the first-floor west-facing apartment of the house at 2410 Russell just above Telegraph that looked out over the parking lot where the Jabberwock folk club once stood. Good folk music vibes! 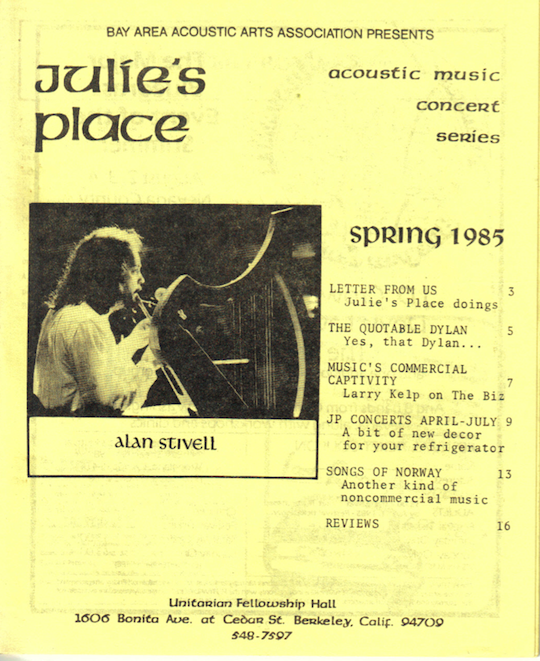 The premise of Julie’s Place was low overhead, no fixed costs, moveable folk music concerts. 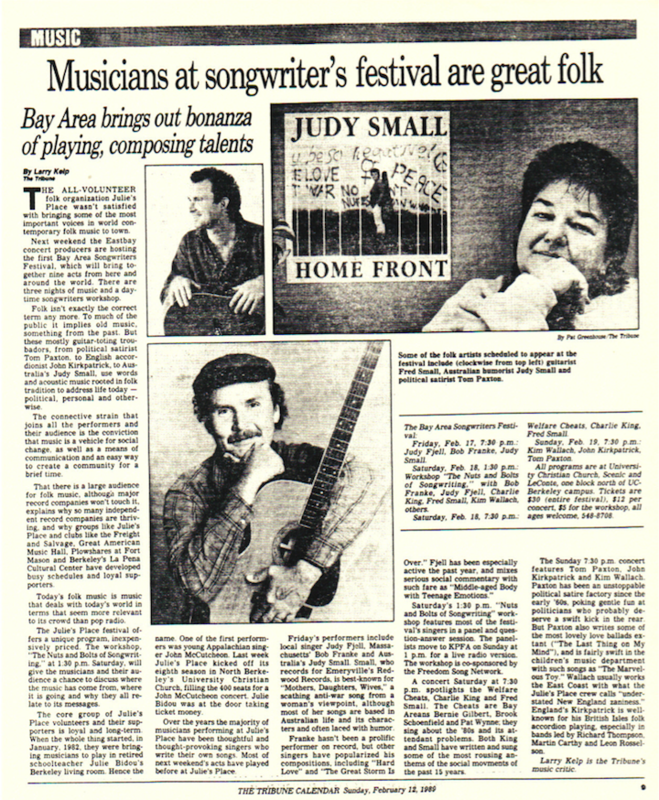 It was an idea that gave us folk music from 1980 until 1994. Julie’s Place to have virtually zero overhead – no employees, no office, no phone, and no fixed hall. For this reason, they were able to turn almost all of the income over to the musicians. Smiler started with house concerts. He couldn’t do them in his tiny apartment so he did them in the living room of Juliette “Julie” Bidou. 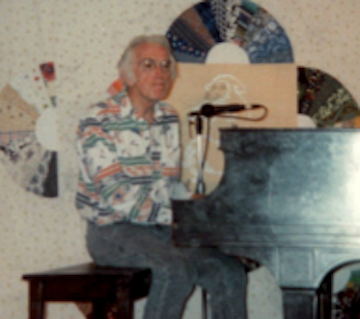 Bidou had been active in the folk music and Unitarian scenes since the 1940s. 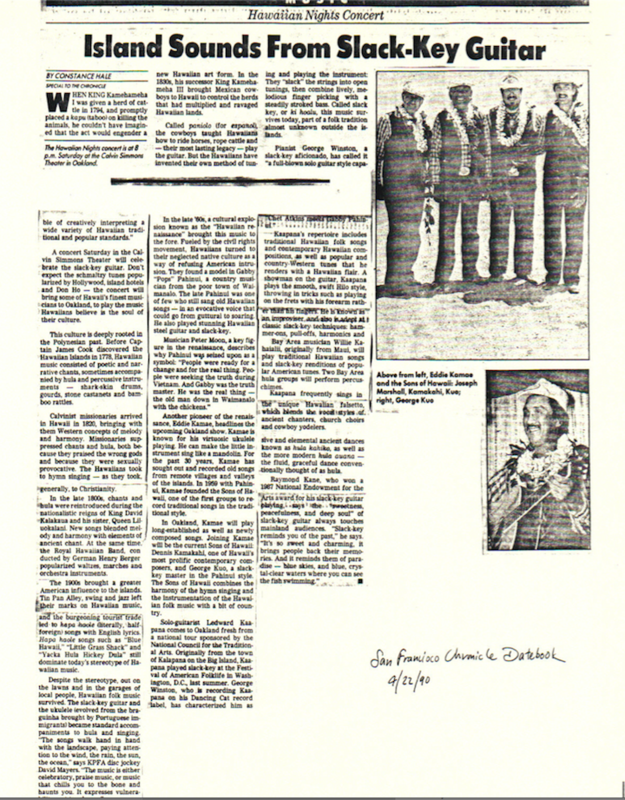 She was born in San Francisco in 1918 and grew up in Manteca. 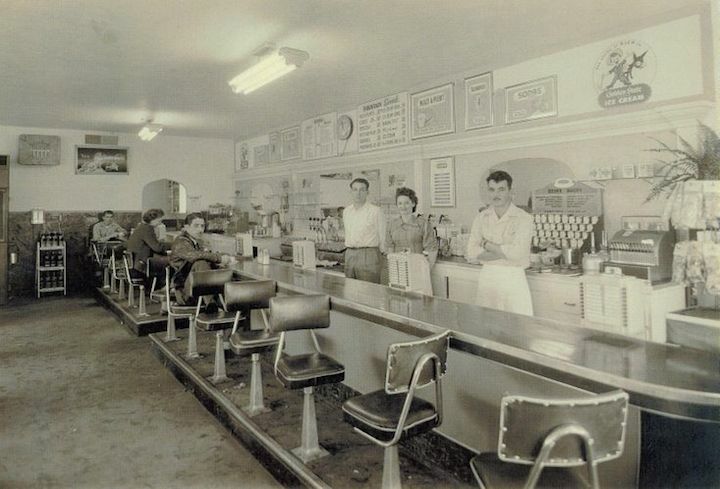 Smitty’s Milk Bar, Grant and Yosemite, Manteca. Photo: Manteca Bulletin. Manteca! To Berkeley! She graduated from Cal in 1941 and has made her life here and in Oakland. She sometimes performed with Nancy Gendel. Their group was called Les Mechants. 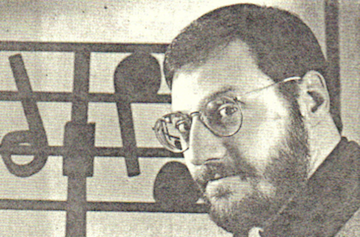 Smiler’s 1983 album “Curious Rhythm” includes “Loud Baylero,” a song he learned from Julie Bidou which they performed together. In 2008 she released an album entitled “Timeless French Songs and Favorites” fem recordings made in earlier days. She lives here still, at Strawberry Creek Lodge. 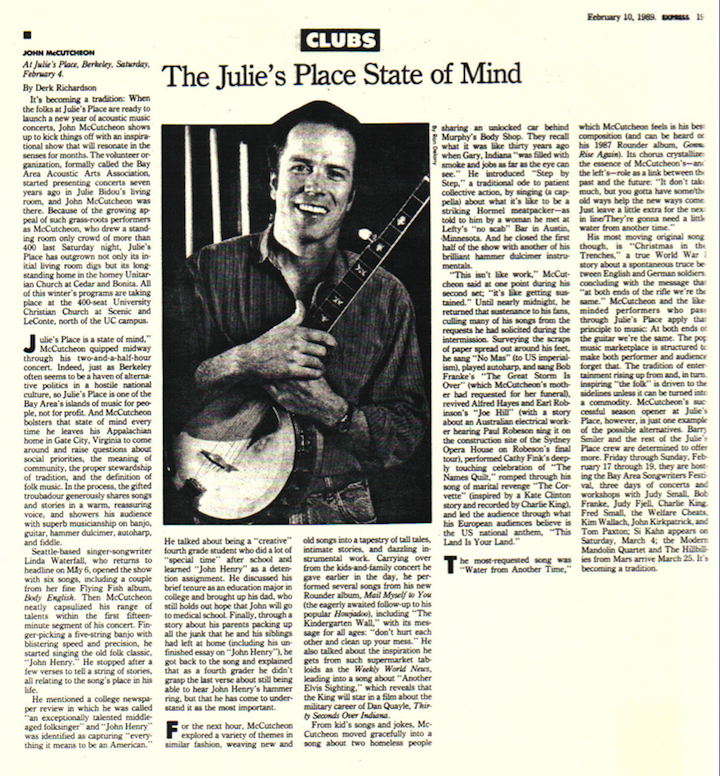 She is part of the folk music scene there – folk music in her living room, which was where Julie’s Place started. Full circle! 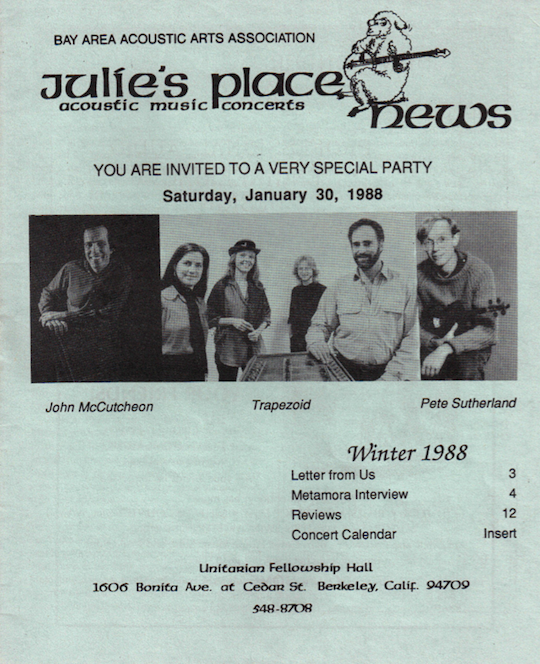 The Julie’s Place concerts were promoted in the name of the Bay Area Acoustic Arts Association. The music was a draw, and the events outgrew Julia’s living room. 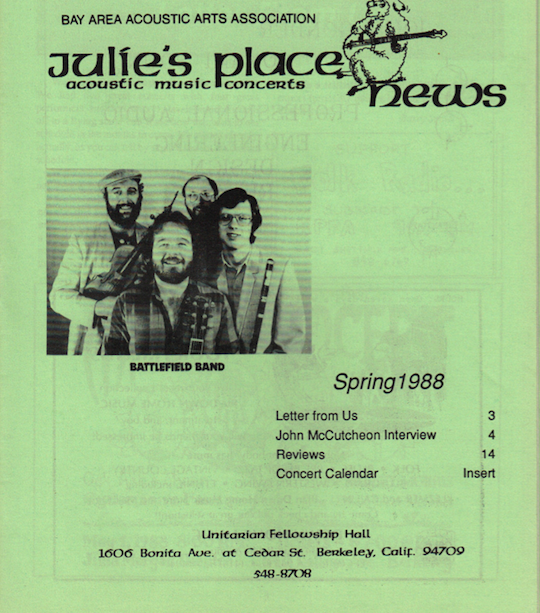 They moved the concerts to larger spaces including the Unitarian Fellowship Hall (1606 Bonita), the University Christian Church (one of the many Walter Ratcliff buildings located on Holy Hill), and the First Congregational Church in Oakland (2501 Harrison). 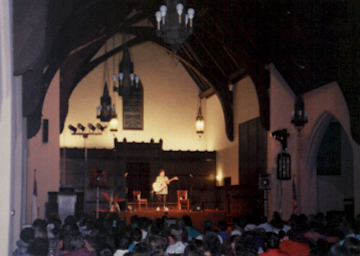 The church venues could seat 300-400, making it larger than the average folk club and roughly the same size as the Great American Music Hall in San Francisco. 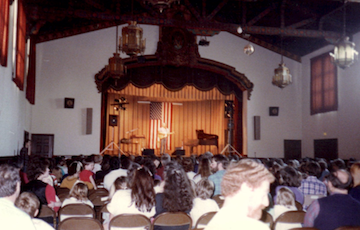 Occasionally they used even larger spaces such as the Julia Morgan Center and the old Calvin Simmons Theater. 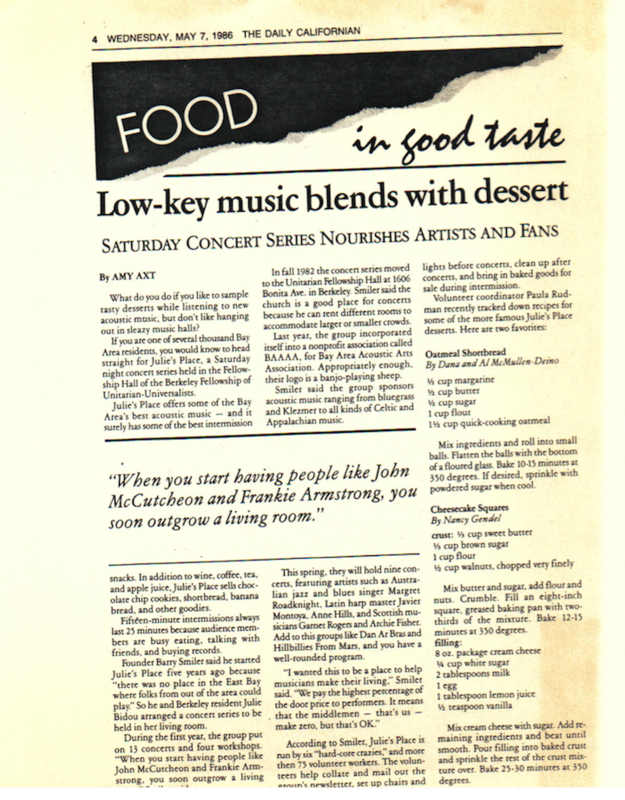 Performers included ohn McCutcheon, Robbie Basho, Leon Rosselson, Judy Small, Roy Bailey, Louis Killen, Malcolm Dalglish & Gray Larson (later Metamora), the Limeliters, Tom Paxton, Earl Robinson, Utah Phillips, Rosalie Sorrels, Peter Beagle, Guy Carawan, Jean Ritchie, Bob Franke, Alan Stivell, Si Kahn, Tom Paley, Archie Fisher, Dave Van Ronk, Pat Sky, Laurie Lewis, Martin Carthy, John Kirkpatrick, the Watersons, the Battlefield Band, June Tabor, Peggy Seeger, Ronnie Gilbert, as well as harp festivals, songwriters festivals, storytelling festivals, a Chinese orchestra, the first big Hawaiian concert in the Bay Area, and a Vegas-level stage magician. 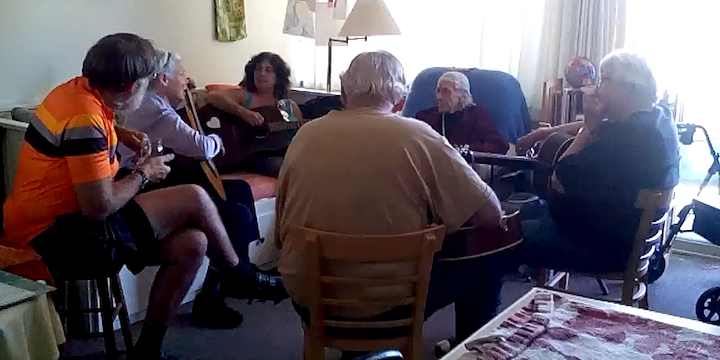 One way Julie’s place was able to attract the cream of the crop of national and international folk/acoustic performs of that era was another service they offered. 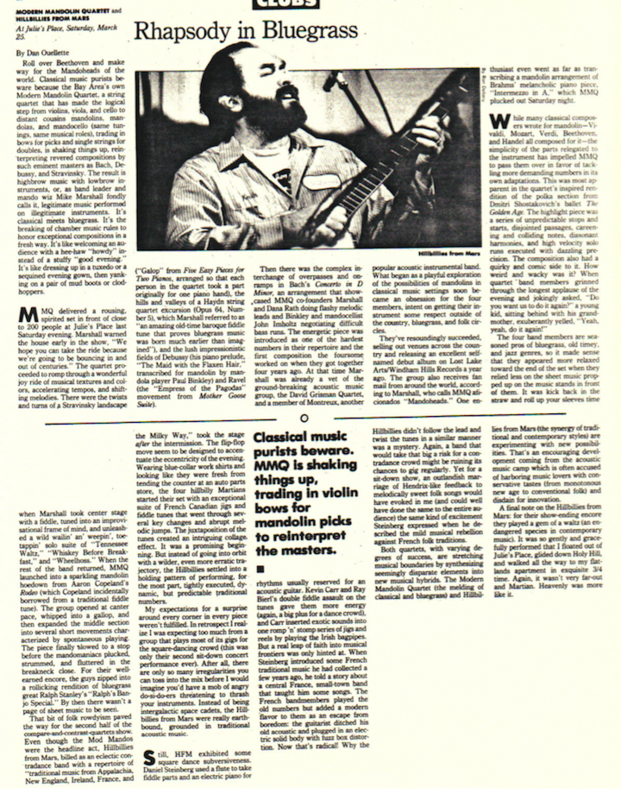 In order to make it financially viable for people to come to the Bay Area, Smiler often booked them full west coast tours, which made it financially possible for them to perform in Berkeley. Smiler left Berkeley in 2008 for the friendly confines of Baltimore. 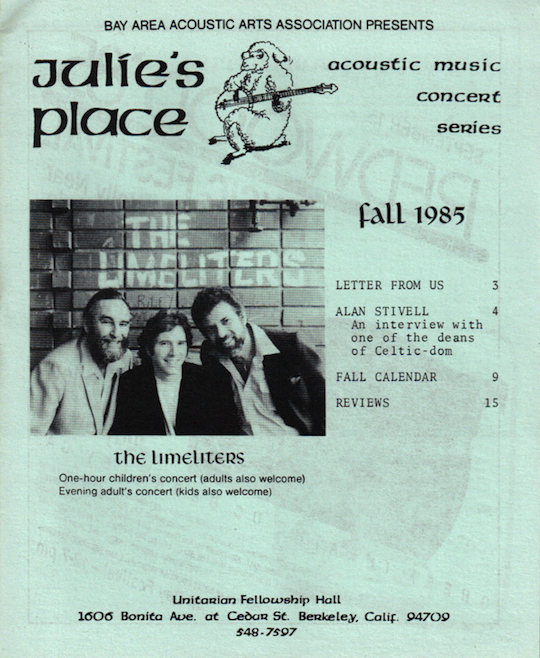 Nothing lasts forever, but we were better for having had Julie’s Place. I took my laptop with this draft post in to my friend. He was listening to “My Cup Runneth Over with Love” from the 1966 Broadway musical I Do! I Do! You may think of the Ed Ames version, admittedly the most famous. Sometimes my friend listened to the Ames version, sometimes the Musical Island Boys version – a barbershop quartet from New Zealand. Tonight he was listening to the original cast album, Robert Preston and Mary Martin. It was a song that my friend’s mother loved. I mentioned Julie’s Place and he perked right up. He told me that he went to “many if not all” of their performances. 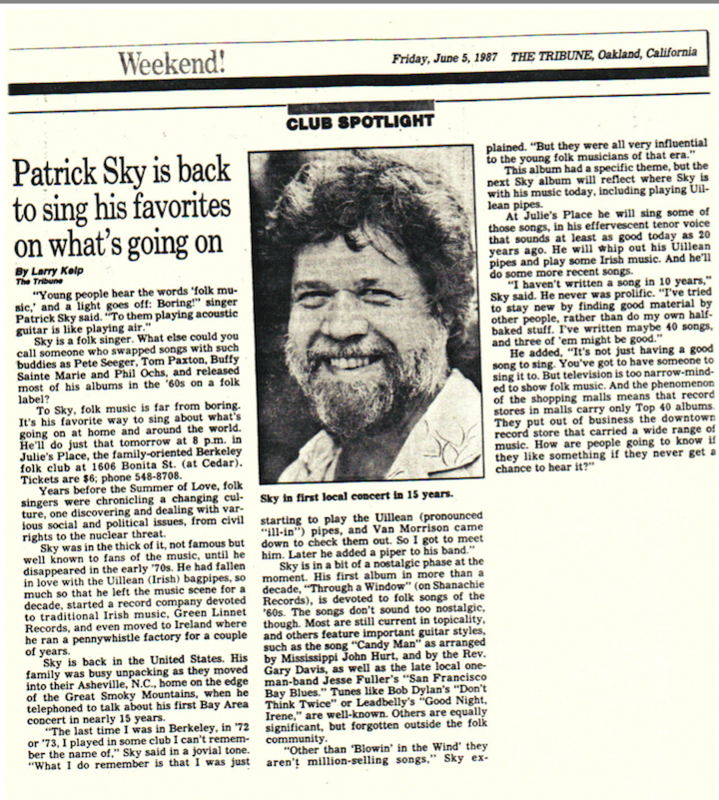 Well, I know that this cannot be true because of his frequent absences from Berkeley, but he was clearly cheered up by his memories of the music and company. What about this post? 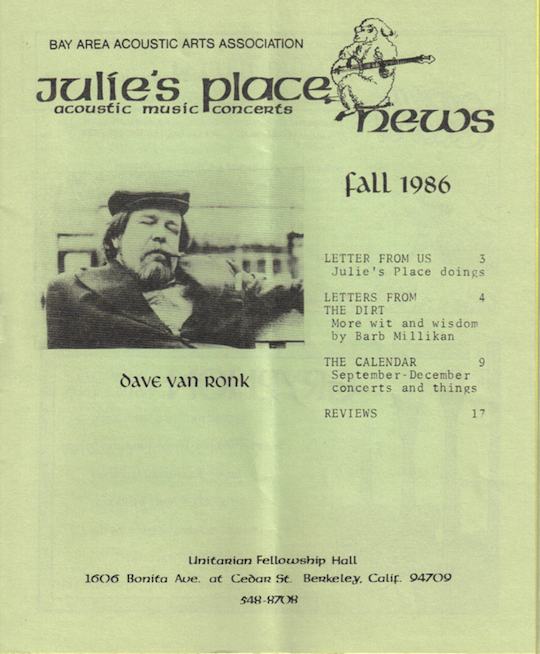 I remember when Barry booked the Plowshares Concert Series before he switched to Julie’s Place – he was instrumental in the development of Plowshares and sorely missed when he made the transition. 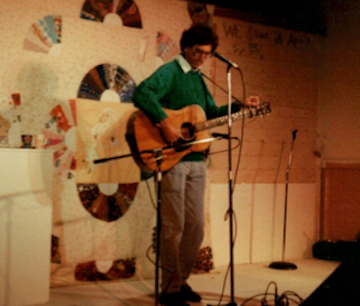 His expertise and knowledge of the “folk music scene” was unsurpassed and he did a great job.